Swordfish are caught mainly in winter. Marlins are very popular target species for sport and recreational fishers. Billfishes swordfish and striped marlin are becoming more popular foodfishes in Australia. While grouped together under the name billfish , they have distinctive textures and flavours. 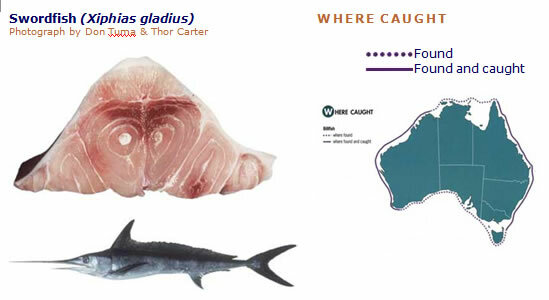 Striped marlin flesh is darker and more strongly flavoured. It is firmly textured and quite low in moisture. Most suited to grilling, marlin can also be prepared by baking, poaching, shallow frying or smoking, or eaten raw as sashimi. Simply sear marlin on a hot grill and serve with a citrus and pecan salsa. Or you may wish to add spicier Thai flavours. Try char-grilling but keep the centre rare to avoid dryness. Marlin is delicious smoked and is a common entrÈe. Oiliness Medium or extremely high, Swordfish has one of the highest oil contents of any finfish. Moisture Dry to moist, Striped marlin is usually medium or dry; swordfish is moist or medium. Both quickly become dry when overcooked. Flesh Colour swordfish pink or off-white. Flesh white when cooked. Serve swordfish with a fuller style of wine such as a marsanne or an oaked chardonnay. For something out of the ordinary, try marlin with a youthful shiraz with plenty of pepper and light on wood. Alternatively, a sparkling red made with single varietals shiraz, merlot, or malbec is excellent with Thai-spiced marlin.